This raised bog is a lasting example of an intact bog in Western Europe and the landscape holds over ten thousand years of history. There is a visitor centre for explorers to enjoy as well as a nature and wildlife reserve and information panels on site. There is a 1km looped boardwalk around the bog area. Amenities: There is full wheelchair access and free parking on site. Opening hours and costs: The bog and centre is FREE to visit with the boardwalk open any time daily. The centre is open on weekdays from 10am-5pm. The village of Geashill was founded originally as an Anglo-Norman manor in the 12th century. Later Geashill Castle was constructed in the ruins of the medieval tower house. Today visitors can explore the heritage of the town through the architectural conservation area at Geashill. Amenities: The village is accessible and there are facilities such as toilets and parking in the village. Opening hours and costs: The area is FREE to visit and open daily. 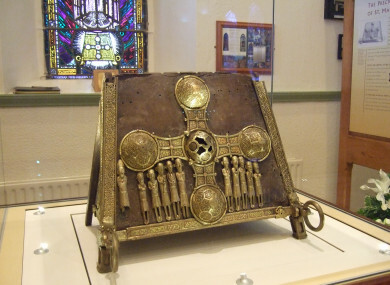 At the Boher church grounds lies sacred relics as well as bones of St Manchan who died in 664. A shrine was constructed around 1130 at the site to honour these and this shrine remains on view for visitors today. Amenities: The site is fully accessible to wheelchair users and there is a car park. An ancient manuscript is housed here within the gothic building that is on display to visitors. The manuscript entitled Gospels of Mac Regol was inscribed in the 800s when the monastery was at the height of its power. Amenities: There is full wheelchair access and toilet facilities available. Opening hours and costs: The manuscript is FREE to visit and the library is open on weekdays 9.30-5.30pm, with late opening to 8pm on Wednesday. It is also open on Saturdays from 9.30am-1pm. This high cross dates back to the ninth century and its head remains in the local church at Rath. It is a key feature from the monastic foundation at Drumcullen, close to the banks of the river Camcor. Amenities: Refreshments are available and there is wheelchair access to the church. Opening hours and costs: The church is open daily and is FREE to visit. Thanks to Offaly County Council heritage office for recommendations. TOMORROW: Top 5 must-sees in Roscommon and Sligo. Email “Your summer in Ireland: 5 must-see sites in Offaly”. Feedback on “Your summer in Ireland: 5 must-see sites in Offaly”.